Preheat oven to 400° F. Lightly brush a baking pan with butter. Make a deep, lengthwise cut in each plantain. Brush well with melted butter and place in the baking pan. Roast until cooked through and browned, between 35-40 minutes. In the meantime, heat the oil in a large skillet over medium heat. Add the onion, garlic, salt, oregano, pepper and cumin, and sauté until the onion is soft and translucent, about 5 minutes. Add the ground turkey, breaking it up so there are no lumps, about 3-5 minutes. Stir in the tomatoes and corn, and bring to a simmer. Cook covered until most of the liquid has evaporated and the turkey is cooked through, about 10-15 minutes. Adjust the seasoning to taste. Stuff each of the baked plantains with a heaping spoonful of the turkey mixture. Cover with cheese and return to the oven. Continue to bake until the cheese is melted, about 10 additional minutes. The cooking time will vary based on the ripeness of the plantains. It is hard to go wrong with plantains–from the green ones perfect for tostones to the blackest, over-ripe plantains that make candy-like maduros. 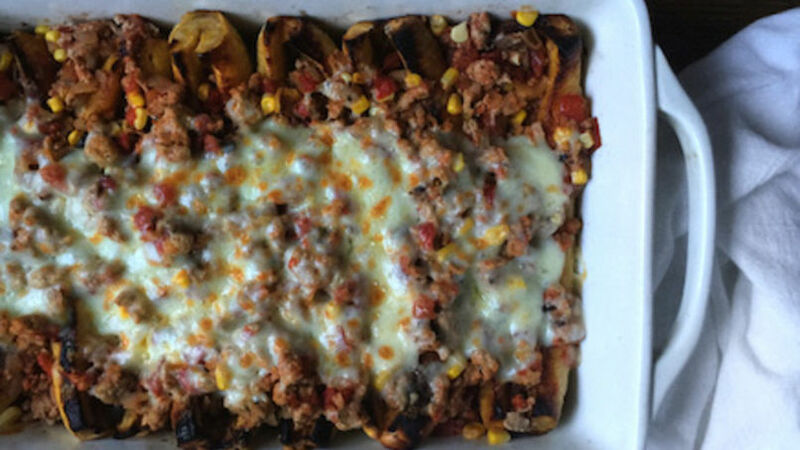 For these stuffed plantains recipe, look for plantains that are yellow with a few black spots. They should be firm enough to hold their shape but sweet enough to complement a savory, spice-filled picadillo made with ground turkey.